A good reference book will certainly pay dividends, giving information on what to look for, and treatments available when it comes to health problems. It will also give the novice poultry keeper a better idea when to call for professional help. It is also worthwhile when you get your hens, finding a vet with an interest in poultry, before it is necessary to use their services. Not all vets are familiar with poultry so it is worth asking. 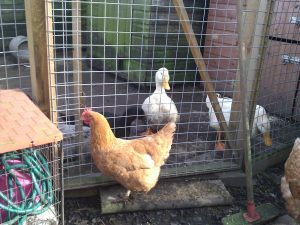 To keep any problems to a minimum, two of the main aspects to concentrate on are housing, and regular checks on the chickens. The housing for chickens needs to be well ventilated, but not draughty. Ensure the perches are not too high, preventing foot injuries such as Bumblefoot. Never use hay in a chicken house, line the nest boxes with mite free straw, and non- toxic sawdust makes a good material for covering the floor. It is important to make sure that these materials do not become wet. A wet environment causes ammonia and other noxious gases forming, which can lead to lung infections in the flock. If signs of illness are noticed in a chicken it is important to isolate it as quickly as possible. It will need a warm well-ventilated coupe, with food and water available. When planning for having chickens it is worth thinking about where you would locate such a chicken away from the main flock. How do I know if my chicken is unwell? The best way is leaning on your fork with a cup of tea from your flask! Watch the flock, are they all busy, are they carrying their wings and tail in the same position? If one is holding its wings or tail down, suspect that you may have a problem. If you suspect you have a chicken that is unwell, check to see if it is breathing normally. Check eyes and nasal passages for any discharge, and check if it smells differently from the rest of the flock. Check for an infestation of mites; check the body, head, the base of the feathers, and the feathers themselves. If you see signs of mites, or critters (mites, lice, etc) as I call them, dusting powders are available from poultry and farm suppliers. With a small flock it is worth treating the rest at the same time. If left untreated, mite infestations are very debilitating and can lead to death. It is worthwhile to remember that mite and lice infestation can be a secondary cause of illness, as they will infest poultry that are below par, so you should always check for any other primary causes of illness. It is also sensible to periodically check the legs of your chickens. If you notice the scales on their legs looking swollen, with perhaps white crusts around the top, suspect that a small critters are living down there. Wash the scales with warm water, and obtain a treatment available from the local poultry or farm suppliers, this will evict the mites or lice. If the chickens are reluctant to go into the house at night suspect that you may have an infestation of red mite in the house. These pests live in the cracks and crevices of the hen house. When the chickens roost at night they come out to feed on the chickens. They are greyish in colour, but turn red after a good feed on your poultry’s blood. If suspected, remove the perches and all other removable parts of the house, including all bedding materials. Give the house and removed items, a good scrub out with water and a small amount of Jeyes Fluid or similar disinfectant. Make sure the house is dry before putting the chickens back. Chickens are normally very healthy individuals, but when they become ill they go down hill very quickly. 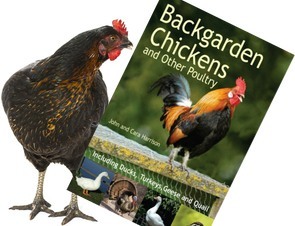 Access to a good reference book can help you to diagnose what is wrong with your chicken and help you to decide whether you need to obtain professional advice.